Traffic is insane in Pune. Cars, auto-rickshaws, motorcycles swarm nonstop all around, honking, honking, honking. No crosswalks or stoplights for pedestrians, no designated safety zone. If you’re not careful, you’ll get hit. If you’re too careful, you’ll be stuck. One day, still new here, I was trying to navigate around the traffic circle by the Toyota dealer when a scruffy older man, holding an umbrella, bid me hello. I’d noticed him just before, outside RIMYI. He was short, soft-spoken, and largely toothless; walked with a slight shuffle; and smiled sweetly. “Are you Japanese or Chinese?” was his first question. Then he told me that he sells crafts to the yoga students. “I know all the people who come here,” he said. His name was Johnny. I didn’t know what to make of him. But, in that traffic chaos, I was amused to be strolling with friendly company, our umbrellas bobbing along. “Go slowly, slowly,” he said, calmly making his way through a barrage of vehicles. “What are you looking for?” he asked. I first stopped at a dollar store; no luck, but the staffer directed me to walk further to some tailor shop. When we came to another crossing, Johnny repeated his advice to go slowly. “They’ll stop,” he said. He had a point. You must find the slightest gap and then walk slowly, so that vehicles can go around you. Let them maneuver, not you–because you’ll never be faster. Also, never stop, keep moving. I found the shop, and the neatly dressed proprietor showed me two options, both woven and quick-drying. either 150 or 165 rupees, about US $2.45 to $2.70. Johnny and I agreed that the 165-rupee one was better finished. It came in various colors and I asked Johnny to choose an auspicious shade. The pink one, he said, and then tried to haggle the price down for me! “Give her a discount,” he said. “It’s her first time here.” The proprietor politely refused and wrapped my towel in newspaper. Johnny then helped me cross another street to get to the More grocery store. While I was shopping, my temporary guardian angel disappeared. Addendum: A few days later, I saw Johnny again and bought a mini brass elephant for 250 rupees. I wanted to reciprocate. 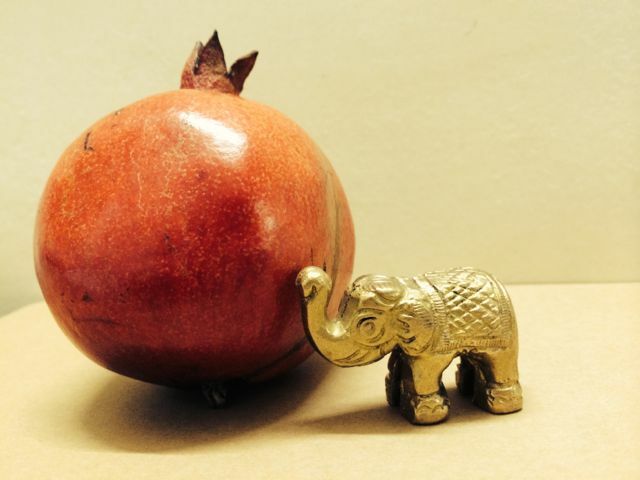 Plus I took a liking to this little guy, shown here with a tennis-ball-sized pomegranate for scale. Good advice, to go slowly but deliberately. I logged on to read about your bus trip, then found I had two posts to read. A real treat as I settle into the last day of the August long weekend, thank you! I’m so enjoying your account. Thank you. Might you mention your flight arrangements here in the blog or elsewhere? I’m really enjoying your posts! Thank you fo taking the time to write them. Hi Luci it is so refreshing to remember al the little challenges and conundrums of the first time in India and Pune. Happy to read your pots! Yes, cover your eyes, don’t look, and don’t stop. It sounds a little Republican, but it probably works in India. Ah, an American POV. Not to mention the elephant. No, my elephant is nonpartisan and above all of that! luci – that traffic description is all too real! go slowly, don’t stop, take the gap, you can never be fast enough; seem to be teachings in the making, albeit an impossibly complex one in one go.